This is the beginning of a fun week full of recipes for cookouts and summer meals. Read all about it below, and don't forget to enter the giveaway! It is huge! Good Luck! But first, I want to share with you a salad I love to make and enjoy in the summer when it is hot. This salad is cool and refreshing and it is a great dish for serving a group of family and friends! 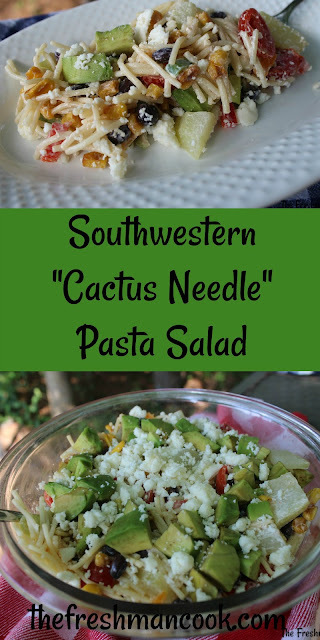 I call this dish Southwestern "Cactus Needle" Pasta Salad, not because I used cactus needles, of course, but because I made this salad with little tiny pieces of pasta called "Fideo", and they remind me of cactus needles. 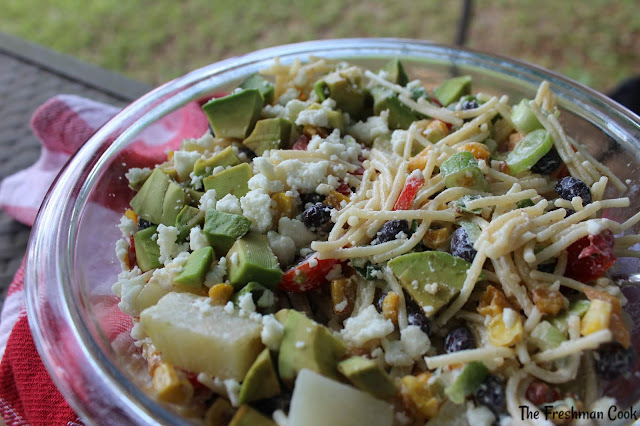 This pasta salad also includes little chunks of Chayote, which is a mexican squash, veggies such as tomatoes, onions, and roasted corn, and a homemade dressing that brings all these flavors together perfectly! 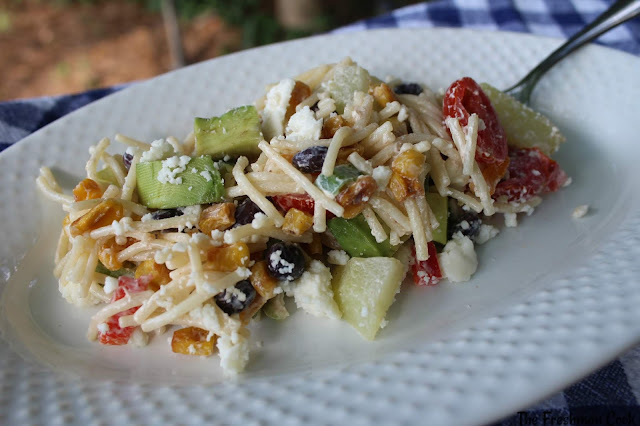 This salad goes well with any entree, from a delicious steak to a tasty grilled hot dog! Boil the pasta according to package directions. It should boil for approx. 7 minutes. Let cool completely. 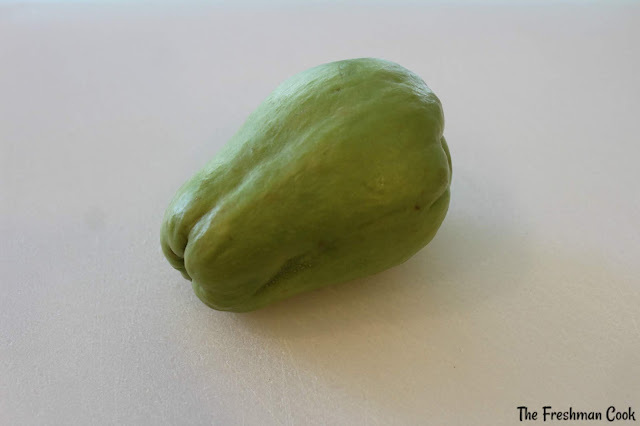 This is what a Chayote looks like. This one is rather large, and a smaller one would be acceptable for this recipe. Place the Chayote in a pan covered with water. Turn heat to medium high. If it boils, that is fine. A Chayote this large takes about 20-25 minutes to soften. A smaller one will take less. Check for tenderness every 5-10 minutes. 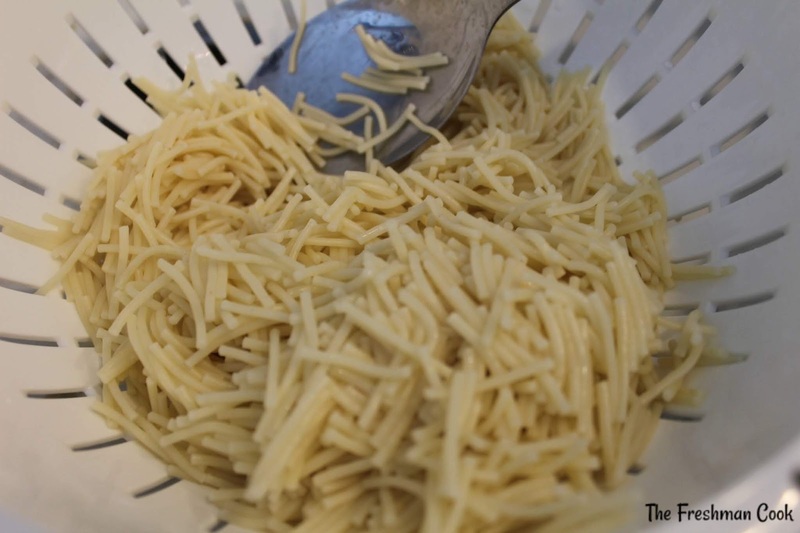 Once it is tender, remove from heat and use a peeler to remove the outer skin. It should come off easily. Set aside to cool. 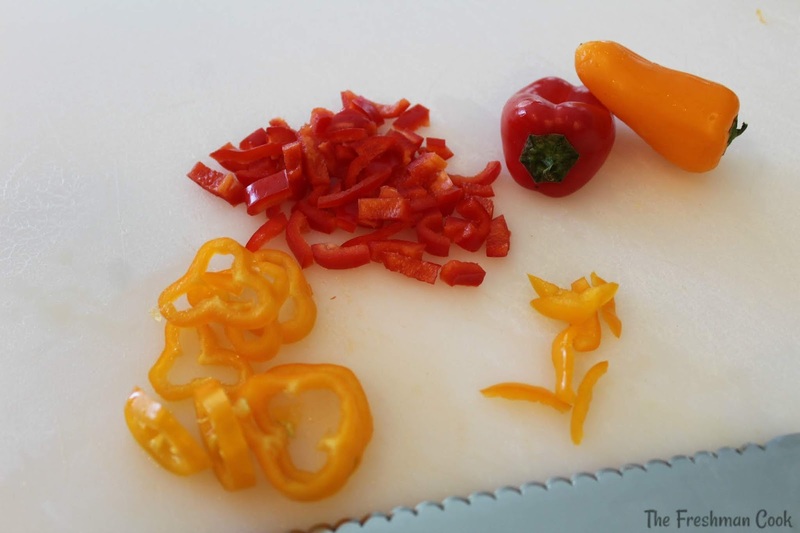 While the Chayote is cooking and cooling, chop the peppers. 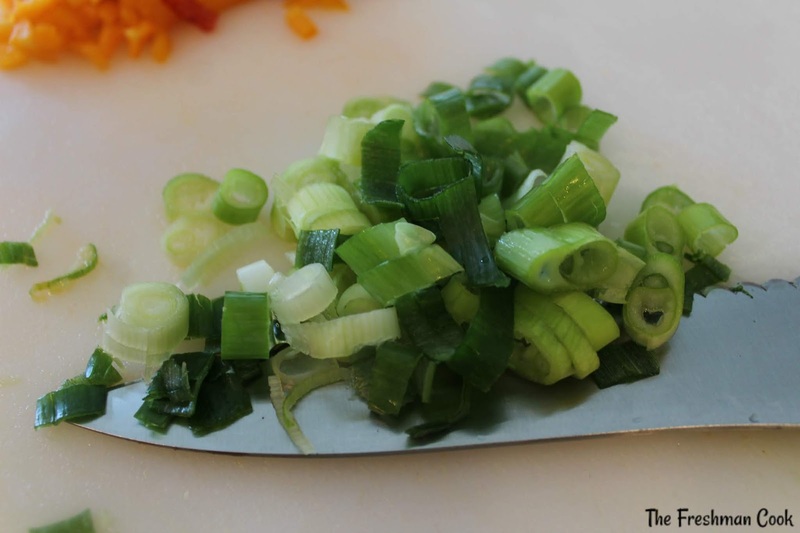 Chop the onion, and slice tomatoes in half. Roast the corn. It is easy to pan roast corn. Melt butter in a frying pan, with the heat on medium high. Add the corn. 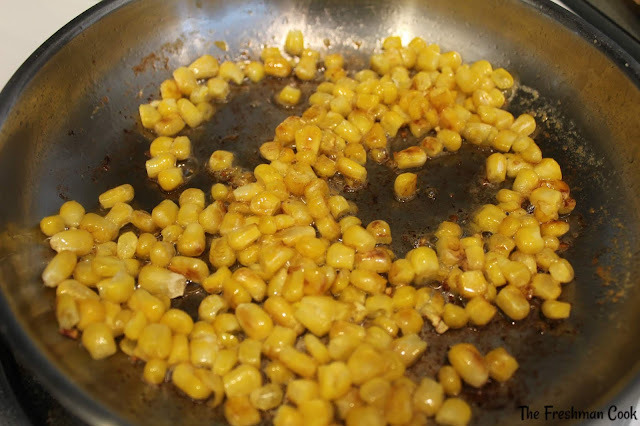 Let it sit for a minute, then swirl the pan around covering the corn with butter. Let corn cook for a few minutes, then turn corn over as it begins to brown. Remove from heat when you are happy with the color. Make dressing by mixing together the mayo and sour cream. Add in the minced garlic. I buy mine from Target, already minced, in a jar. It is amazing! Add in the chipotle powder. Whisk together. Add the juice from the lime. 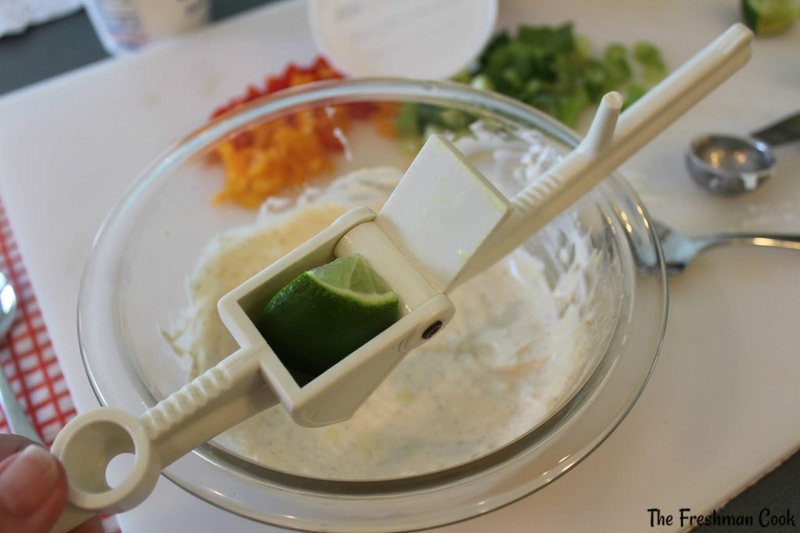 When I need to add fresh juice, I use a garlic press. I have arthritis, and I can't press on the fruit anymore to get all the juice. The garlic press works so well. I roll the fruit to make it tender, then I cut the fruit to fit the press, and do it several times with more fruit if needed. So easy! Whisk everything together and refrigerate. 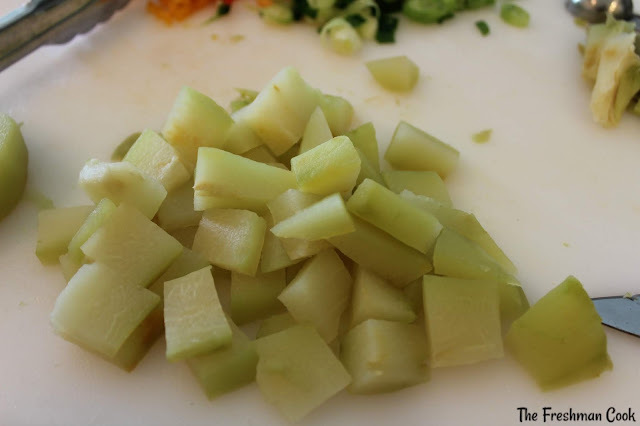 Now that the Chayote is cooled, remove the seed from the middle, and throw away. 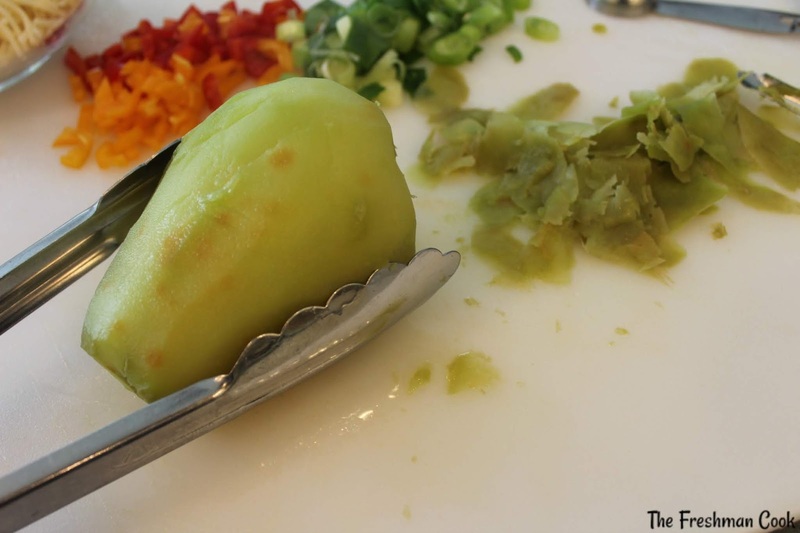 Slice the Chayote and the chop into bite size pieces. 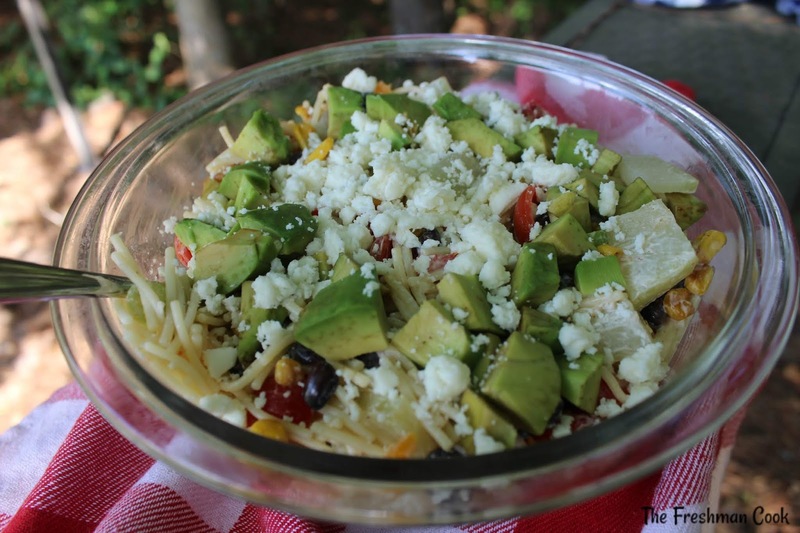 Start putting everything together by filling the bowl with the pasta, vegetables, beans, and the chopped Chayote. 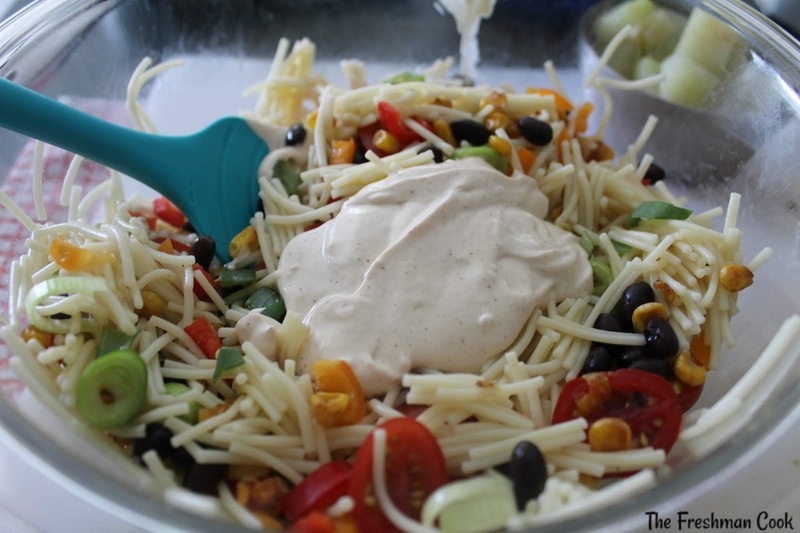 Hold back the avocado and cheese, and mix in the dressing. When you are ready to serve, add the avocado and crumble the cheese over the salad. Thank you for stopping by today! Keep scrolling down the page for a copy of my recipe and read about all the other recipes and the giveaway.! Don't forget to enter! 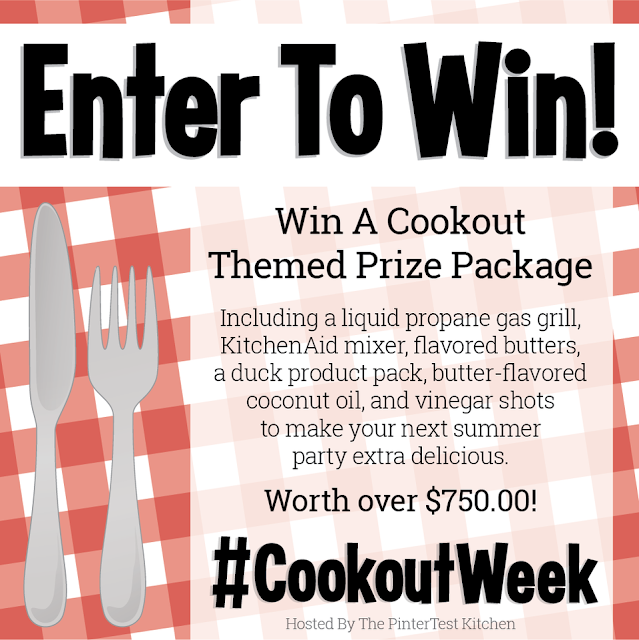 Here's a full list of the bloggers participating in #CookoutWeek 2018!